Cost to install a microwave varies greatly by region (and even by zip code). Get free estimates from kitchen designers in your city. Cost to install a microwave varies greatly by region (and even by zip code). Get free estimates from kitchen designers in your city. The average cost of installing a microwave is around $200. How much does it cost to install a microwave? Microwaves make life easier in the kitchen, heating food and liquids quickly and cutting down on cooking times. Most people have a microwave somewhere in their kitchen, with many people opting to have it permanently installed as part of the design. The average homeowner typically spends around $200 for a new microwave that is installed above their range. Microwaves often do more than simply heat food through vibrating moisture. Some microwaves have combo features or functions that allow you to grill food ($300 to $500) or become a convection oven ($400 to $600). Keep in mind, however, that when investing in a microwave, you also need to consider its size, location, and ultimate purpose. These combo-featured microwaves may not be as reliable for microwaving or function in certain areas of the kitchen. Do your research before committing to a combo oven to ensure it meets your needs. Microwaves come in a variety of sizes. In some cases, such as a countertop model, the size does not matter beyond personal preference. However, for custom built-in 1 units and above-range installations, the size of the microwave is very important. For this reason, countertop models come in several sizes, while above-range, built-in 1, and under-counter models have a more limited set of sizes. Typically, this will be between 29 to 30-inches wide, 15 to 16-inches deep, and 16 to 18-inches high. Take careful measurements of any openings before purchasing to ensure the new microwave will fit. Microwaves are fairly straightforward to install, regardless of whether they are above-range models, built-in, or installed using brackets 2 below the cabinets or counters. Nearly all microwaves come with an installation kit that includes brackets and hardware designed for their installation. The kit is usually installed first and then screwed into place. The microwave is plugged in and slid into the brackets. If the microwave vents out of the house, this will be hooked up just before the microwave is slid into its bracket. Installing a microwave is a fairly quick job and can be carried out by either an electrician or handyman. 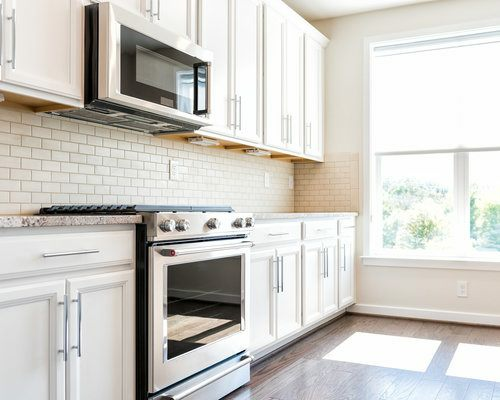 Above-range microwaves are the most common type installed in the U.S. Costs for this type of installation are usually between $50 and $100, depending on how tight the fit, whether there are existing brackets 2, and if the vent needs to be connected. The total job takes less than hour to complete on average. The only difference is in the installation of a built-in model. In this case, the microwave should be installed by the cabinet installer to ensure the best fit. This can increase labor costs to a minimum of $200. If you are looking for a countertop appliance to cook and heat food, you may want to consider toaster ovens vs microwaves. Toaster ovens take up less space and can brown and crisp food as well as warm it. However, a toaster oven will also take longer to cook or warm food and cannot heat liquids. If you want a built-in microwave, you need specialty cabinets. These cabinet costs start at around $400 a linear foot. If you install a microwave where there is no current electric outlet, you will need to have one installed. This costs around $200 to $750 on average. Many microwaves have a defrost setting that helps speed cooking. This is becoming a standard feature, but some models may cost around $50 more on average. Another increasingly available feature for microwaves is built-in sensor technology. These features can tell when food is close to being done. For example, a popcorn setting will stop before the popcorn burns. Microwaves with this feature start at around $200. Most microwaves are fairly easy to maintain. Keep in mind, however, that above-range models may collect grease. When using a countertop model, try to locate it in an area where you do not need the counter space. If you do not have space for a countertop model, an alternative is to purchase a microwave cart, which can be positioned anywhere in the kitchen. Microwaves have different wattages. The higher the wattage, the faster it will cook, but the higher the price. Lower-wattage microwaves tend to be slower and not cook as evenly. Many microwaves have several preset cooking settings. These often include things like popcorn, pizza, frozen dishes, potatoes, and rice. These settings make using the microwave easier and more convenient. Generally, a handyman will charge less for the installation than an electrician. However, an electrician can add an outlet if necessary at the same time. How long does it take to install an above-range microwave? It takes about an hour on average to install a microwave above the range. What does it cost to have a microwave installed? Can all microwaves be mounted? No, microwaves are designed for specific uses and areas. Does an above-range microwave need to be vented? Yes, all above-range microwaves need to be vented, but some simply vent back into the room, while others vent outdoors. Check your local building code for specific requirements. Can any microwave go over the range? How much does it cost to install a microwave in my city? Cost to install a microwave varies greatly by region (and even by zip code). To get free estimates from local contractors, please indicate yours. A support that projects outward from one surface to hold another surface to it, such as attaching a shelf to a wall or piece of furniture. 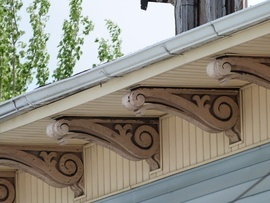 Brackets can also be used to strengthen joins between two materials.